Ready to protect your boiler? Get a BoilerMag on Amazon today. Over the last decade or so, power flushing has become less and less popular. This is partly since magnetic system filters (also known as boiler filters) are becoming more popular. Power flushing gets rid of debris that has collected in a system. And up until recently it was the best solution. However, magnetic system filters catch most debris and it’s a great idea to have one fitted. Using one means that a power flush doesn’t have the impact that it used to. What is A Magnetic System Filter, and How Does it Work? Do You Need a Magnetic System Filter? Are Magnetic System Filters Worth It? Put simply, it’s worth investing in a boiler filter. It stops heating sludge clogging up radiators, towel rails, and more importantly, your boiler. For hard water areas, you should also consider fitting a limescale reducer. A heating system is built using various metal components. Take your radiators and copper piping for instance. As the years go by the insides of the pipe and radiators rust. This rust breaks off and starts to circulate through the heating system. This is combined with dirt and scale that is contained in the water in your system. Together, these particles form central heating sludge. This is where big problems start to occur. The sludge settles in places that cause major issues. A typical example is at the bottom of radiators. Have you ever wondered why radiators are warm at the top, but not at the bottom? Had a recent pump failure on your boiler, or had to replace the heat exchanger? If you have, that’s going to lead to expensive repair bills. These are common symptoms of sludge build up. And, a magnetic system filter is designed to catch this sludge and prevent this from happening; they save your heating system, and you money! Check out this video and you’ll see how the magnetic system filter tackles sludge in a matter of minutes. As you can see, the sludge circulates around the heating system. The magnetic system filter catches most this sludge as it passes through the filter. The filter can then be emptied to ensure it doesn’t fill up (and stop protecting your heating system). There are plenty more details on boiler filters after this section. But, if you’re already convinced, you’re probably confused about which are the best boiler filters on the market. Below, we’ve curated a list of the best magnetic system filters that are the most popular, reliable and effective. You can buy all these filters at reputable plumbing merchants throughout the UK, but usually for cheaper online. BoilerMag tops our list for a tonne of reasons. They’re one of our favourite heating & plumbing brands, and we’ve already created a big guide on their BoilerMag filters here. They’re up there with the biggest names in the boiler filter industry, and they deserve to be; they’re on-par, if not better. For the price of a BoilerMag AND chemicals (i.e. their chemical pack), you’ll only have the budget for a filter (if you’re lucky), from other leading brands. BoilerMag filters are cheap! Fernox is one of the most reputable brands in the filter industry. The Fernox TF1 offers excellent value for money from a brand with this much weight. 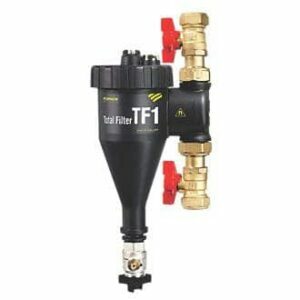 Buy the Fernox TF1 on Amazon. Generally, we stick to Instinct, Fernox and MaganClean filters. However, if you are planning to have a Worcester Bosch boiler installed, then get their own brand filter. By using their filter, you will get an extra years warranty on your boiler. However, bear in mind Worcester Bosch magnet filters are one of the most expensive on the market. Buy the Worcester boiler filter on Amazon. 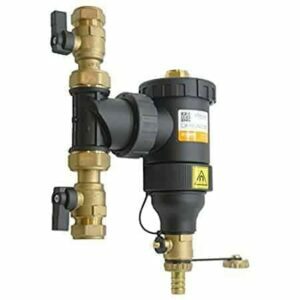 The Altecnic Dirt Mag filter comes with a 2-year warranty and is an excellent budget filter that has become increasingly popular over the last few years. 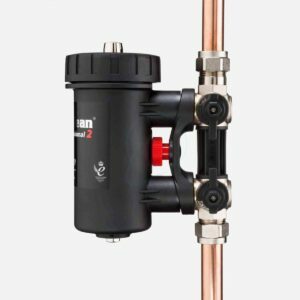 Prices start from around £70 for the MagnaClean Micro, and around £85 for the MaganaClean Professional 2 Chemical Pack. Adey are probably the biggest supplier of magnetic system filters in the UK. Even so, their prices are incredibly reasonable. 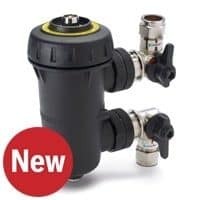 The MagnaClean Micro is the smaller filter on offer. If your budget allows, then it’s certainly worth going for something bigger such as the MagnaClean Professional Chemical Pack. We regularly get asked if a magnetic system filter is a necessary addition to a heating system. The answer is always yes. We never replace a boiler without fitting a sludge filter alongside it. And here is why. 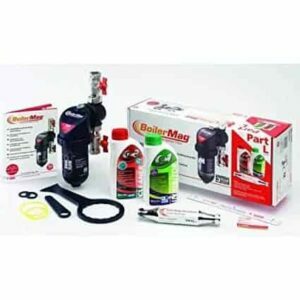 Boiler manufacturers warranties. A lot of top boiler brands will insist two things for their warranty to be valid. The heating system should be correctly dosed with inhibitor. This helps break the sludge in the system down. The heating system should have a sludge filter installed. This ensures that any faulty components are faulty, and not just the victim of sludge. So, it’s worth checking manufacturer terms and conditions to ensure that you warranty is valid if you don’t currently have a magnet filter installed. Many people ask us why there isn’t a magnetic system filter already installed if they are so important. Well, one of the top brands is Adey (they produce MagnaClean filters). The brand was created by Chris Adey back in 2003 and the filters started coming to market. It took a good few years for them to become popular so most boiler installations before 2008 won’t have one installed. The only exceptions seem to be heating specialists that suggest a homeowner have one installed to protect their heating system. Inhibitor will work in tandem to a system filter. The inhibitor works hard to break down any debris in the system. Without inhibitor, a lot of the stubborn debris build up will not be broken down. Instead it will settle in places such as the heat exchanger and radiators. When inhibitor is correctly dosed in the system, it will allow broken down debris to flow in the heating water. This makes its way back to the return where the sludge filter is waiting to collect it. Radiators are hot at the top but they won’t heat up at the bottom. They don’t get hot at the top until you bleed them, and you must bleed them regularly. The boiler is making strange noises such as banging or gurgling. Some radiators don’t get up to the temperature you require, even when the stat is set to maximum. The boiler pump has started leaking, or you’ve had multiple pump failures. Pipes to a radiator get hot, but the radiator never seems to heat up. When broken parts from the boiler are removed, they are full of dirt. The return on the boiler is cold (or Luke-warm), even though the flow is boiling hot. Problems from sludge build up quickly compound. Sometimes they get so bad that aspects of the heating system need to be replaced (such as radiators, the boiler pump, or rad valves). The magnet filter will not act as a total cure, as it’s more of a prevention method. Any heating engineer will be able to install a boiler system filter. The first thing they will do is check to see the size of the pipes that run to your boiler. This makes a difference to the price of a filter. Some lesser known brands might charge £50-60 for a 22mm sludge filter. However, a 28mm version of the same filter is likely to cost 35-40% more than this. Once you’ve decided on a filter (costing between £60-150), the next cost is the actual installation cost. Expect to pay £100-150 for the installation. In total, the magnetic system filter installation will be £150-275. This is certainly a ballpark estimate for installation costs. A sludge magnet can take anything from 1 to 4 hours to fit. This will depend on the ease of access to the filter and if any adjustments to pipework need to be made. One other consideration when having a boiler filter fitted, is it’s worthwhile having a flush. Even a quick manual flush of the heating system is a good idea. This will get rid of most the debris in the system, so the filter doesn’t get blocked. Another option is to have the heating engineer come back a week later and clean out the filter. The filter will have caught most sludge in the system so will be good for another 12 months without any maintenance. This cost is easily offset by the money savings you’ll see on heating repairs over the years, not to mention that the filter will help to keep your central heating running much more efficiently. Like all parts of your central heating system, a magnetic boiler filter will need to be maintained on a regularly basis. We always suggest that the filter should be checked and cleaned every 12 months. Luckily, this coincides with most boiler schedules. If you don’t have an annual boiler service already, I’d certainly suggest you book one in. When the Gas Safe engineer arrives, ask them if they can inspect and the clean the filter out. If the filter is easy to access, this shouldn’t add much to the cost of your service, as it only takes 15-30 minutes to clean out. A quick inspection and clean is all the maintenance that a filter will need. You can learn more about boiler servicing costs here. If you have any questions regarding magnetic system filters, please leave a comment below and we’ll get back to you as soon as we can.